Hana Lee is as project director at CompassPoint. As a project director, Hana leads (or co-leads) several kinds of offerings for CompassPoint program participants, including cohort leadership programs, consulting engagements, and public workshops. She also plays key program design, project management, and facilitation roles within CompassPoint's highly collaborative project teams. Previously, Hana found her home and heart in food justice and has worked across various organizations and capacities in food systems. 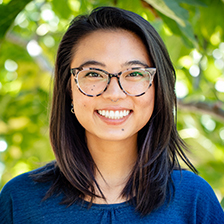 Most notably, Hana gained her love for experiential learning and popular education pedagogy at the Edible Schoolyard Project, where she served as their program manager. There, she worked alongside a community of educators, farmers, and chefs to develop and iterate on a whole-child approach to teaching CA standards based curriculum in a two-acre farm and kitchen classroom in Berkeley, CA. Much of Hana’s facilitation practice comes from her time facilitating learning experiences in K-8 classrooms and leading the Edible Schoolyard Academy, which convenes over 100 educators annually from across the globe to learn and share best practices of garden and cooking education. It is there that she learned the power of convening. She has presented at the Annual California Farm to Cafeteria Conference, the Biannual National Farm to Cafeteria conference, and guest lectured at her Alma Mater, University of California, Davis on inclusive teaching practices and strategies in experiential classrooms. Hana is a proud child of immigrants, a product of the public school system, and lover of people and food (in that order). Hana believes that food is the center of community, heart, and solidarity. This principle guides her in her work and mission to connect all people to their inner power, by way of their relationship to food, culture, and nature. As a child of the Korean diaspora, Hana is constantly immersing herself in traditional Korean food, mythology, and art to reconnect with her roots. Hana is a lover of all things print and hand lettered, avid consumer of pop culture, and is a Young Thug enthusiast.